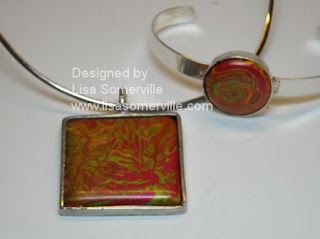 No stamped cards here today, instead I have created some Melt Art using my Melting Pot, Colored UTEE and some Jewelry Pieces. I had gotten my blank Jewelry from Kitchen Sink Stamps, you can see the bracelet blanks here. I didn't see the pendant listed on the KSS Site, but you could always email them and see if they have any in stock. 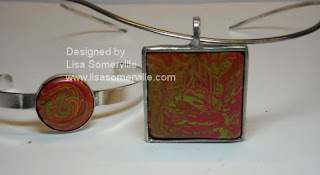 These pieces would fit nicely in this Altered Box I did a few weeks ago using my JustRite Stamps. Once your pour your UTEE into the jewelry blanks, gently tap out the air bubbles, then let cool. Your pieces will pop out if you tap lightly, then you can sand down any rough edges, and glue the Melt Art back in place with Super Glue or Glossy Accents. Lisa, your work is always so wonderful and inspiring! The jewelry pieces are no exception. When I clicked on your blog today, I literally gasped!! They are really, really beautiful!! Wow, Lisa, that is just outstanding!